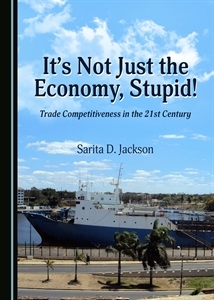 Sarita D. Jackson, Ph.D., instructor in the UCLA Extension Department of Business, Management and Legal Programs, recently published a scholarly book titled It’s Not Just the Economy, Stupid! Trade Competitiveness in the 21st Century (Cambridge Scholars Publishing 2016). Dr. Jackson shifts our understanding about how industry’s compete in the global economy away from market-based models alone toward other factors such as history, international trade rules, and bargaining power. Furthermore, Dr. Jackson uses her findings to present recommendations for developing trade policies that enhance the benefits for producers in specific industries. Her book is timely as debates surrounding the benefits and costs of free trade remain at the forefront of the 2016 presidential elections.